On May 10th I spent a good portion of my day at the mall, I wasn’t shopping (ok well I did but that’s a part of the story read on my friend) I was lending my voice to an organization that is near and dear to my heart, KidsAbility. Every year they hold a radioathon to help raise money to continue doing their amazing work. KidsAbility gives kids with disabilities a start at becoming as independent as possible though programs that start when the child is quite young. They work with the parents and other health care professionals and develop a plan that works to help the child better live / overcome their disability. They work on a verity of fronts to achieve their goals. When I was a child and I was a part of their program they went by a different name and they were located in a much smaller facility. I had to work on gross and fine motor skills as well as speech, the teachers and therapists who work there were and still do are amazing. Places like KidsAbility are hugely important in our communities without them a lot of these kids wouldn’t thrive wouldn’t know the thrill of being independent. Some kids go there for little things and when they over come those obstacles. Today marked the first time that I published a column. I started with an intro article just talking about me, about my life and what I hope to accomplish in this amazing opportunity. So far just with that one post the response has been more then I could hope for! Getting plenty of positive feedback and a really needed reminder to proof read or have someone else actually proof read as there was an annoying spelling error that could have been avoided. Hope not to make that mistake again. One of the things I dealt with growing up “different” was that I didn’t see myself on TV. I don’t mean me physically (I was ok with that) but a I never someone with a facial difference. I never saw “ME”! I heard it described like this by African-American actors back in the day. They were so few actors of colour that they couldn’t identify with the shows/movies they were watching.</p><p>I’m a pretty big TV junkie love lots of shows but haven’t really seen someone with a facial difference. I know the show HOUSE did an episode featuring someone with a facial difference but in recent history that’s the only one I’ve seen. It’s not like I don’t understand why this is. When you are casting for a role you are looking for something specific and people without a facial difference can be “anybody” meaning there needs to be no explanation as to why they look the way they do. If the actor’s hair is blonde it can be dyed, If the actor needs glasses they don’t have to wear them for the role. With someone with a facial difference there isn’t that choice unless you hire a make-up artist and spend ooodles (yes I just said ooodles) of money to transform that person you are left fitting that individual to that role or vice versa. Knowing this doesn’t make it easier. I grew up envious of people in wheelchairs because they were featured on TV and in a lot of cases there was no explanation needed it was just the actor playing a role. The first time I could identify with a role was the first time I went to Toronto to see a play called “Phantom Of The Opera”. To be honest the first time it didn’t clue in we were far in the back and I was lulled by the music and the production value. They did a really great job. I have seen that play a total of 3 times in Toronto and each time it resonated with me. 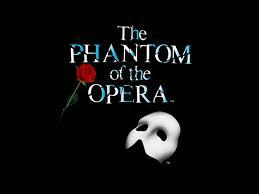 If you haven’t seen or heard of the “Phantom of The Opera” first off where have you been?? and secondly here is a link to Wikipedia I would cut and paste but it’s a long description and better then anything I could write. It really wasn’t until the most recent movie version came out (2004) that I could identify with it. Don’t get me wrong I LOVE the theater production and would see it any night of the week but the movie version was so well done and I could hear all the words and see how it flowed that solidified it as my favourite theater production/movie. 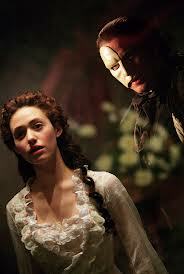 I had never heard of Gerald Butler or Emmy Rossum but now I would watch anything they were in. The part that gets me every time, is near the end of the movie where the Phantom has lured Christine to his “lair” down under the streets on London and while they are talking Christine’s suitor comes a young man named Raoul and during the scene they are exchanging words at one point Christine says “Have you no compassion” the Phantom counters with “The world showed no compassion to me”…. That one line said in that manner I can’t tell you what that feels like. We watch movies as an escape but sometimes there are movies that are made specifically to invoke an emotion whether it be anger, sadness, or a sense of belonging. This movie rang with so many truths for me that it’s hard to say one bad thing about it. I will forever love Gerald Butler for his portrayal of The Phantom the heart he brings is a testament to his skill as an actor. To day is May 1st and has been chosen as THE day to have a big push to end bullying. Everyone knows that I have been a victim of bullying and this year I have the opportunity to speak out against bullying. Today I got to be a guest on a local TV program called Talk Local Waterloo Region where I was among many guests speaking about the subject of bullying. It was a great experience I got to hear about initiatives that I didn’t know about. WRPS (Waterloo Regional Police Services) have been active in going to schools and talking about bullying for years. This year they have a contest called “Stand Up Speak Out” where kids up to 18 years of age are able to submit their best anti-bullying message. They’re 3 categories Video, Word, and Art and kids are allowed to enter as many times as they wish but can only win once per category. There will be 3 winners in each category and I have been invited to be a judge. I did get a sneak peak at some of the entries and they are AMAZING it’s going to be hard for us to narrow it down to 3 winners per category!! The other program being run actively in the area is being put on by Waterloo Region Crime Prevention Council. The project is called THINK described bye WRCPC as “…an initiative of the Crime Prevention Council that encourages people of all ages and backgrounds to ask five key questions before they text, tweet, email, or post to Facebook” The five key questions tie in to the word THINK: T= is it True?, H= is it Hurtful?, I= is it Illegal?, N= is it Necessary? K= is it Kind? Such a simple concept but one that has a powerful message. I find that these types of community programs have the highest rate of success. 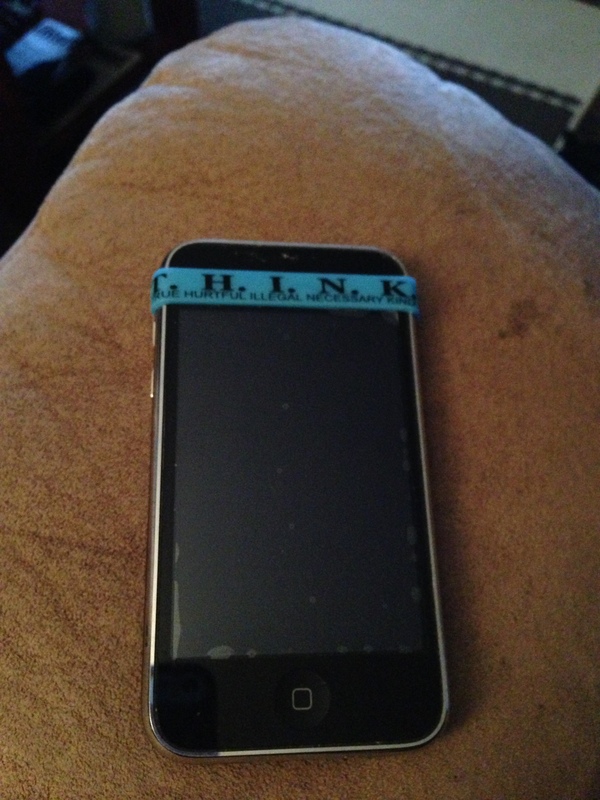 They are giving out these blue elastic bands with this acronym printed on one side which are designed to go on one’s smartphone. From what I have read and heard they are doing really well with this. A lot of these programs work because it’s peer-to-peer. We all know that as adults telling kids what to do goes in one ear and right out the other but when we get kids engaged it has the power to make all the difference. The other issue is that sometimes the adults are the issue and it’s the kids we are depending on to teach their parents that bullying like drunk driving needs to be a thing of the past. This program was aired on local TV and not broadcast online so I will contact the station and order a copy so that I can post on my blog at a later date. The program was really well done not just my segment but the whole show was filled with really great guests. On an unrelated note my Toronto Maple Leafs are in the playoffs for the first time in NINE years!! that’s just crazy. They pointed out tonight on the 6pm news that 9 years ago Twitter and Facebook didn’t exist….I really had to give that some thought to realize they were right!! Right now as I write this my team is losing 4-1 even though they scored the first goal. We are hoping they can turn this around because I would hate for them to get knocked out of the series in the first round.